Chicken Scratch Poultry - Hatchery and Breeding Farm﻿Day Old ChicksBaby ChicksPulletsHatching eggs 618-643-5602﻿larry_angie@chickenscratchpoultry.com Heritage Breed Poultry farm Beautiful Chickens That Lay Beautiful Eggs We are now accepting orders for spring 2019We will begin shipping in April and ship in order of payment received, sorry we can not give a shipping date. New This YearFarmers Choice - The Colorful Egg Basket Box Of Chicks $160Let the farmher (Angie) choose your chicks, 16 chicks, colorful egg layers, price inculdes shipping. ﻿﻿﻿ Please check out all shipping policies and order cancellation policies before placing an order. WARNING!! all content on this website is copyrighted, Do not use any content of this website without our written permission. Infringement of photos is punishable by law! We will begin shipping in April and ship in order of payment received, sorry we can not give a shipping date. Let the farmher (Angie) choose your chicks, 16 chicks, colorful egg layers, price inculdes shipping. Please check out all shipping policies and order cancellation policies before placing an order. WARNING!! all content on this website is copyrighted, Do not use any content of this website without our written permission. Infringement of photos is punishable by law! Here at Chicken Scratch Poultry, we are a small breeding farm and hatchery that focus on rare Heritage poultry. We have a strong belief in sustainable agriculture and believe that raising beautiful, healthy chickens is a direct result of high quality feed, humane treatment and above all, starting with the absolute best breeding stock possible. Here at Chicken Scratch Poultry we made it our top priority to begin with only the best blood lines from rare beautiful poultry breeds from the top poultry breeders in the US. These breeds are not only beautiful but they also lay beautiful eggs. Our chickens are always allowed plenty of room to roam and supervised free range time. If your searching for rare beautiful chickens, you've come to the right place. Join us and become a steward of these rare chicken breeds. We strive to sell High quality chickens, whether they are young pullets, day old baby chicks, or hatching eggs. Keep in mind we are a small breeding farm and hatchery, we keep our flocks small in order to provide the best quality poultry possible. 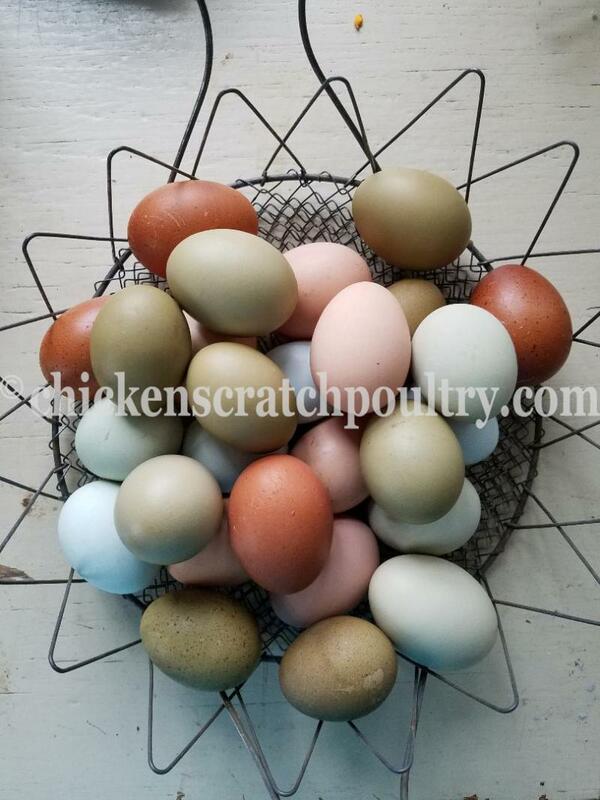 Are You Looking For Beautiful Poultry That also Lay Beautiful Eggs? In Cold weather Our day old baby chicks ship with a heat pack and Hydrating Gel to insure good health.